to offer an Office Administration class! 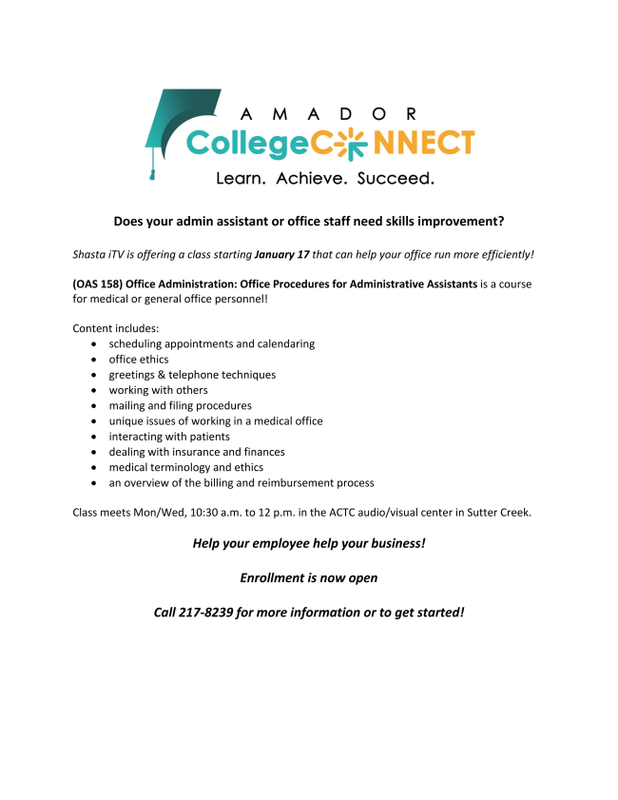 Improve your office administration skills by attending their class in Sutter Creek. Call (209) 217-8239 for more information. Sierra Business Council has worked diligently this year to pioneer and demonstrate innovative approaches to increase community vitality, economic prosperity, environmental quality, and social fairness in the Sierra Nevada through advocacy efforts, small business innovation, and climate action. Traveling up and down the Sierra Nevada, I continue to be humbled and inspired by the small businesses, community leaders, and engaged citizens that contribute to the vitality of our region. As witnessed by recent events across the country, our work in bridging the urban-rural divide is more important, more necessary, now than ever. The eyes and ears of the urban downstream users of the Sierra's resources have finally turned towards our region; we must seize this opportunity to create new lines of communication, understanding, and commitment to solving the region's toughest economic and environmental challenges. Sierra Business Council remains committed to the belief that we achieve our best results with collaboration amongst a diversity of opinions and stakeholders, which means we can't do the work without your involvement and support. The future of the Sierra Nevada is in all of our hands. While we are proud of our positive impact on the region in 2016, we know there is so much opportunity ahead of us in 2017. With your contribution this season (either through our website, mail, or the Give Back Tahoe campaign), we can together continue to enact on the ground projects that will make the Sierra Nevada the very best it can be. Thank you for your consideration and support. Click here to view our 2016 Impact Statement. Happy Thanksgiving! 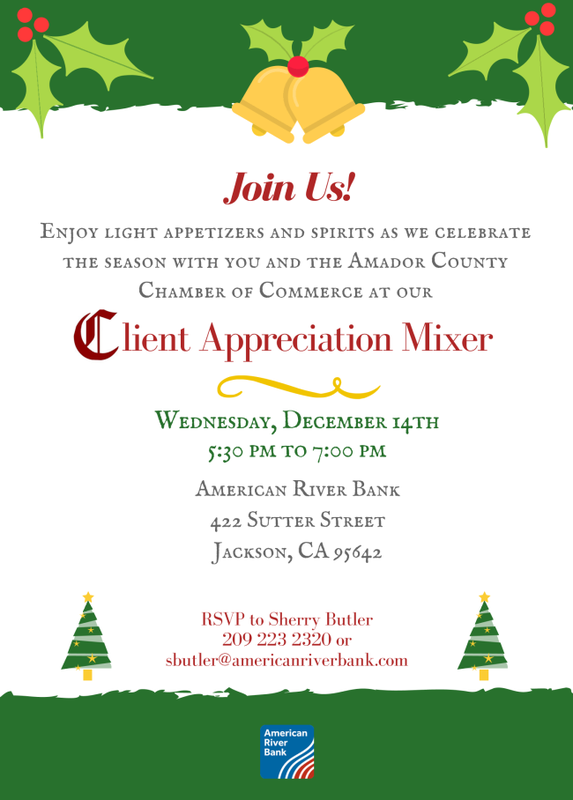 This Thursday, December 8th, at 5:30 pm, at Baker Street West, second floor at Hein & Company Bookstore in Jackson, Amador Council of Tourism is holding its annual general membership meeting. Please join us to celebrate our successes this year, enjoy one another’s company, nosh on light appetizers, and sip local wines. We will review Amador Council of Tourism’s 2016 activities and vote for the 2017 Board of Directors. Regular business meetings occur on second Thursdays, 9 am, at Jackson Rancheria Casino Resort’s hotel conference rooms. We do not meet the following months: March, July, September. Please do call or email me, Maureen Funk at maureenfunk@volcano.net or call my cell phone at 209-969-5065, with questions or suggestions. their usual No-Host Bar. There will also be light appetizers and a raffle. Please feel free to bring a holiday raffle prize and receive free raffle tickets! Starts at 5:30 and runs till 7:30. For any information contact (209) 223-0350.